If you’re too young to remember him then it’s time for an introduction. 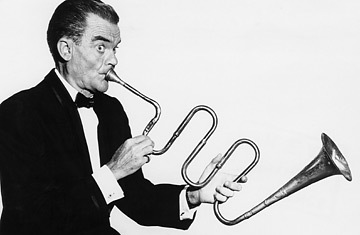 As a musician and band leader, Spike Jones was one of a kind. In the 1940’s and 50’s Spike and his City Slickers recorded and toured throughout the U.S. and Canada as “The Musical Depreciation Revue.” He was a radio star (1945-49) who successfully transitioned into a television star with his own weekly shows (1954-61). He was a trailblazer mixing music and found sounds (burps, hiccups, fog horns, gun shots, etc.) paving the way for Stomp, Blast, PDQ Bach, Monty Python, Frank Zappa, the Beatles, “Weird Al” Yankovic & others. As the son of a Southern Pacific Railroad agent, young Spike was initiated into “kitchen music” by a railroad chef who showed him how to play pots and pans, knives and spoons. His musical parodies of classical, as well as pop, rock, and other genres of music, were legendary. Nothing was too serious to be spared his satirical touch. Spike even took on Hitler in 1942 with his famous “Der Fuehrer’s Face,” which Disney later used in a wartime Donald Duck cartoon parody (which won the 1943 Oscar for Best Animated Short Film). I had an old 45 with “knock knock” by Spike Jones. I never heard Of it again.The flip side was “ya Wanna Buy A Bunny”. I still have the 45 (very poor condition) Anybody familiar with this recording.The song was pretty hilareous.